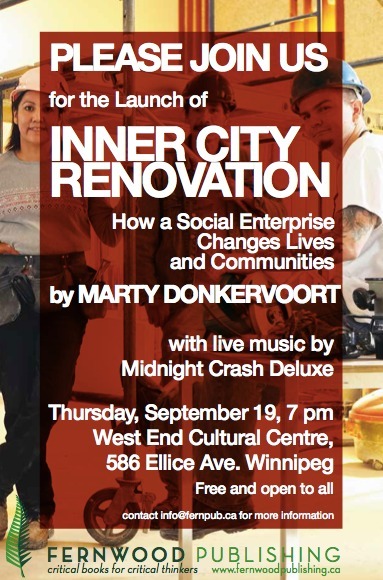 My book is now in print and will be launched at Winnipeg’s West End Cultural Centre on Thursday, September 19, 2013 at 7 PM. The evening will include musical entertainment by the Midnight Crash Deluxe. Everyone is welcome to attend (invite). ”This book gives an insight into personal leadership, enterprising solutions and value creation, making it as relevant to practitioners engaged in social enterprise, urban regeneration and community empowerment as it is to policy makers and students with an interest in social responsibility.” — Gerry Higgins, Founder, Social Enterprise World Forum. A small delegation of social enterprise activists from China will be visiting Winnipeg March 9-14 as part of their Canadian visit. The visit has been organized by Lawrie Deane, Social Work Faculty at U of M. The delegation will meet with various local organizations and social enterprises in Winnipeg including Inner City Renovation on March 13. Participants will include John Baker, ICR General Manager, Larry Morrissette, Executive Director OPK and myself .